Hi gals!!! 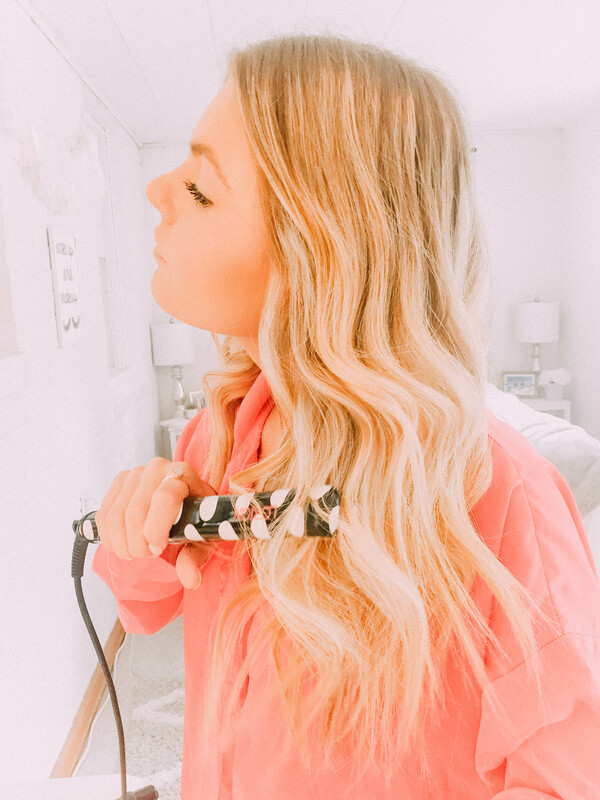 I always get questions about how I curl my hair so I am finally sharing my routine with you! 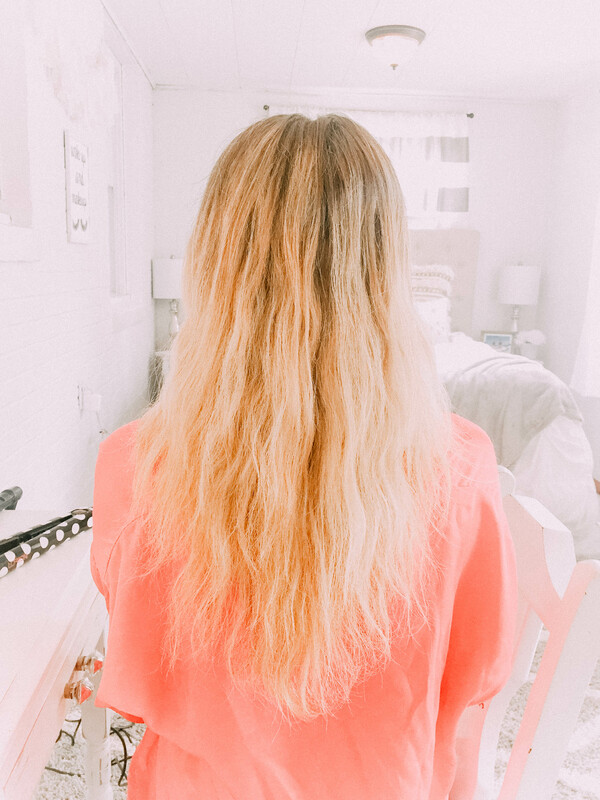 It has taken me some time to master the perfect beachy wave look but I did it!! 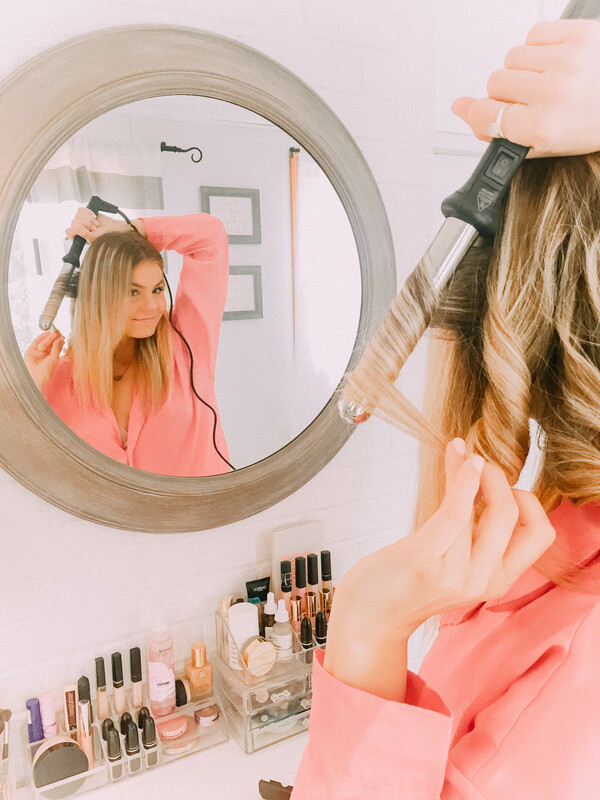 This is how I do my hair every time I style it because it looks so bouncy and effortless. So come getting ready with me!!! Here is my crazy frizzy hair before I curl! I try to let my hair air dry as much as possible to cut down on the heat applied to my hair. 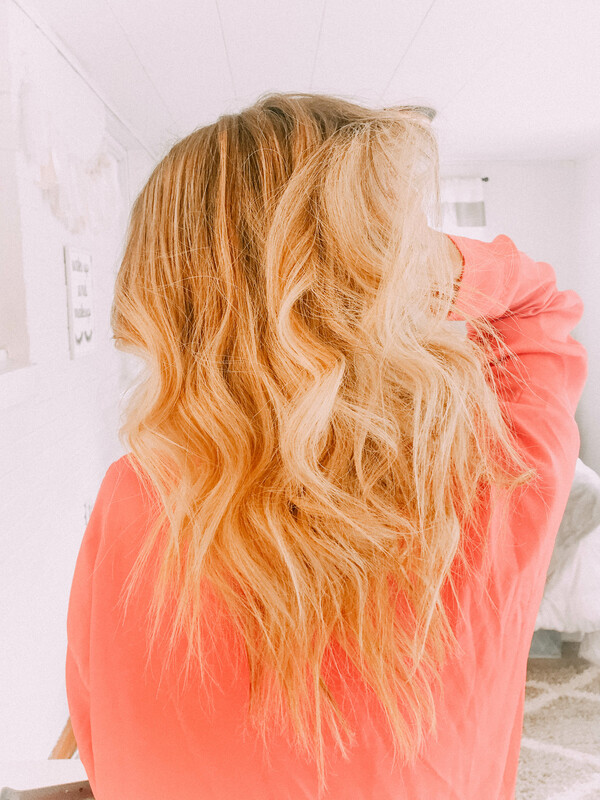 I also only wash my hair 1-2 times per week and this routine holds my curl in between washes! The first thing I do is straighten my roots and the ends of my hair. 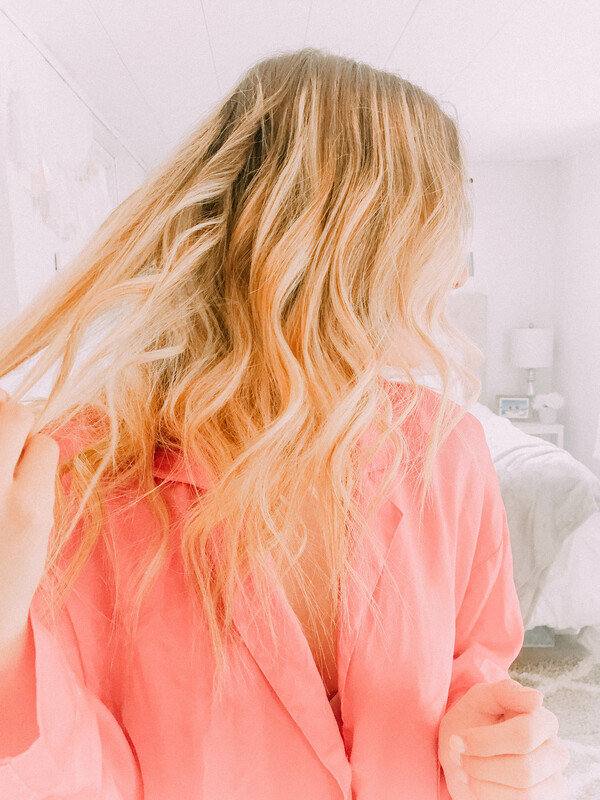 My hair is naturally wavy and frizzy so this helps me to create a sleeker look. I don’t even bother straightening my entire head because it is just unnecessary heat that my blonde hair doesn’t need!! Now on to the fun part!! 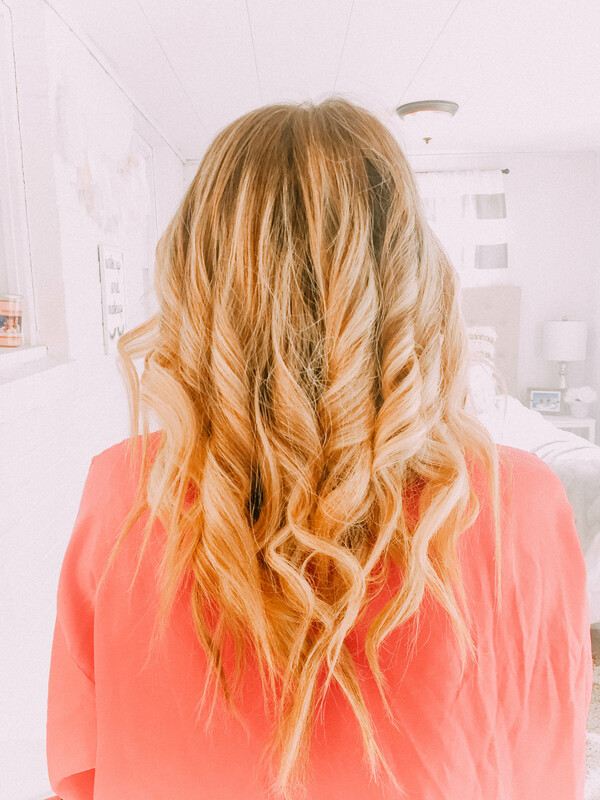 For my curls, I use a curling wand with 1 inch or 1.5-inch barrel, not exactly sure! 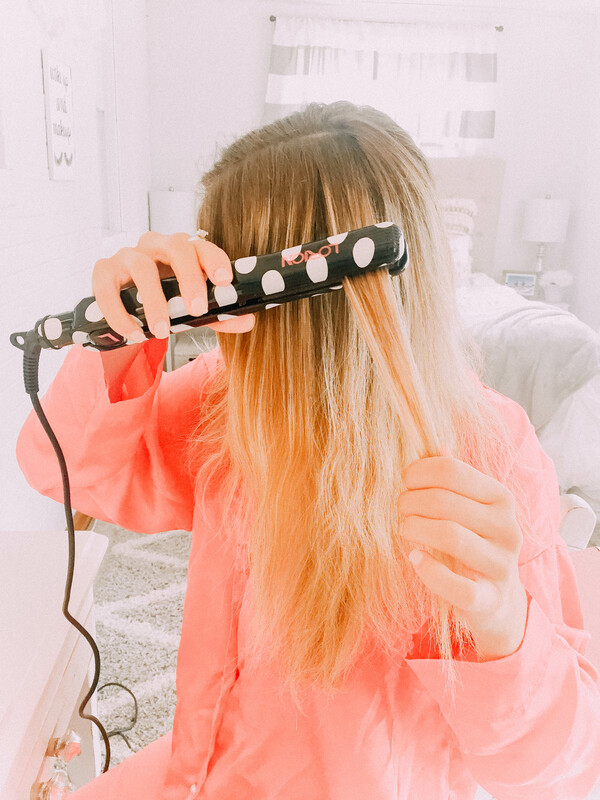 I bought both my curling wand and my straightener from T.J. Maxx and in my opinion, there’s no need to spend money on fancy name brand styling tools because these work amazing and they were around $15!! So I start by flattening my hair in between my fingers and wrapping the hair around the barrel. I only curl the middle of my hair, keeping my roots and ends straight! After I curl the hair, I hold it in my hand and let it cool. DO NOT run your fingers or a comb through it yet!!! I let all my curls cool until I finish curling my whole head. Here is my hair after it is curled and cooled! It looks a little crazy right now but not for long!! Now I gently run my fingers through the curls and pull them apart a bit. I then run my straighter over any pieces that are too curly. I really go for the wavy effortless look and straightening the ends allows me to achieve that! Finally, I add a little bit of hair oil and hairspray to finish off the look. I will link them down below! And that’s it!! I can do this in about 10 mins and it works the best for me! My curls tend to stay for about 4-5 days after I do this routine! 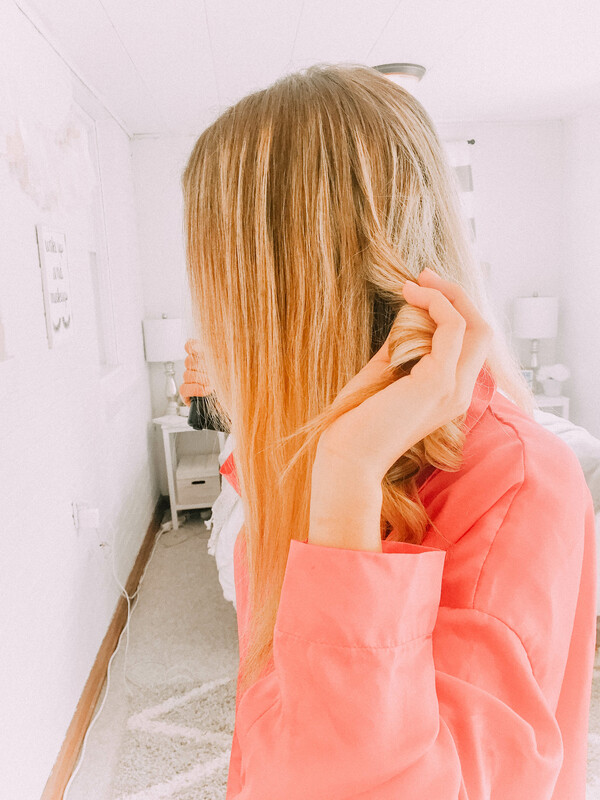 To see all of the products I use to keep my blonde hair healthy, click HERE! Thank you so much for reading! I appreciate every single one of you! Have an amazing day! Love the blog post! Your hair is so pretty!